Real Passion: As Real Salt Lake´s playoff dreams dwindle, RSL´s fans stand their ground. 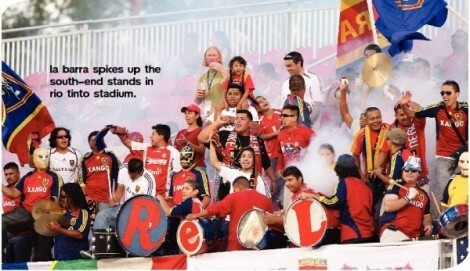 At halftime during the Aug. 26 soccer game between Real Salt Lake and Chivas USA, Hispanic supporter club La Barra Real president, 25-year-old Luis Castro was dancing in a 10-minute mosh pit La Barra organizes at every Real home game on an east-side walkway in Sandy’s Rio Tinto stadium. While already popular with the members of La Barra, Castro hopes that the non-Hispanic, Anglo Real supporters will forsake their hot dogs and beers for five minutes and sample La Barra’s fervent passion for their team. As La Barra members pogoed in a storm of confetti, chanting “Olé, olé, olé, olé, Re-al Salt Lake,” a 14-year-old La Barra member lit an illegal smoke bomb. Real’s operations director Trino Martinez confronted the youth and told him to leave the stadium. When he refused, four Sandy cops patrolling the game took charge. One of them pushed the youth to the floor and handcuffed him. La Barra fans and passersby were furious. A mostly Hispanic crowd of 80 angry fans according to Sandy Police spokesman Sgt. Justin Chapman, surrounded the police, who called for backup. The cops and Martinez yelled at supporters to return to their seats. One officer threatened nearby supporters with pepper spray. Eventually, the police released the 14 year old without charge after they found out his age, and a Real employee took him home. But that did not quell the anger. Castro, an exercise equipment company shipping manager, and his cohorts were upset at what they saw as the cops’ mishandling of the situation, and also at the failure of Real’s front-office personnel to intercede on behalf of some of their most loyal fans. When they returned to their seats for the second half, they furled their flags, put down their nine drums, cymbals and trumpet, turned off the fog machine Real loans them in place of letting them use smoke bombs and watched in near silence. Out of the five Real-recognized supporters’ clubs, all of which receive discounted tickets, newbie La Barra, in just five months, has proven itself a very loud and ardent asset to the team. Unsurprisingly, the group´s silence in the second half against Chivas broadcast their discontent loud and clear. While the other fan clubs developed organically, La Barra grew out of Real reaching out to Hispanic fans at the end of 2008 to form a supporters club. Reaching out to Hispanics is crucial for Real and U.S. soccer’s future success, Real general manager Garth Lagerway says. 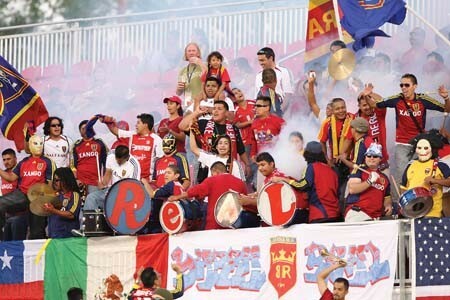 But, Martinez asks rhetorically, “How do you bring [Hispanics] who you know are passionate about the sport to be passionate about RSL?” Bringing what Castro calls “Hispanic spice” to the stands through La Barra provides a powerful statement of the club’s multi-lingual fan base. But as the smoke bomb incident demonstrated, trying to “promote the passion that we’re looking for within certain guidelines,” as Martinez puts it, can be a tricky business. As an organization, Real Salt Lake has advanced in 2009, even if the team on the field has not. For the first time in Utah, Real hosted the annual Major League Soccer [MLS] All-Stars game at Rio Tinto stadium, this time against the English premier league’s club Everton, along with a world cup qualifying game between the United States and El Salvador. Even fan favorite Andy Williams, the only surviving player from what Lagerway calls “the dark days” of the franchise’s first year, doubts his future at Real in 2010. “Especially if I’m not playing, I don’t see a reason to keep me on next year,” he says. A year ago, Williams symbolized Real’s endurance and hope for a brighter future. His wife Marcia’s well-publicized struggles with leukemia brought an emotional intensity to the game every time he ran onto the field. But this season, until the end of August, Williams spent a good part of most of the games on the bench. When he complained, Kreis responded he had to train harder, be more vocal on the field and add something to the game. In late summer, Williams sparked in training, Kreis says, and all of the coaching staff saw it. Williams had played the full games in the two games prior to the Fire match, but Williams shakes his head about Kreis’ ringing praise in the press for his return to form. “I haven’t changed anything,” he says.